Magical Moves Keyboard lets children make music with innovative infra-red technology. Children can play familiar preprogrammed songs, explore 3 different instruments, change tempo, and hear different styles of music and sound effects. 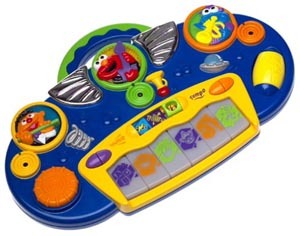 Features include 6 favorite children's tunes, tempo and volume control buttons, scratch pad with different sounds, spinner ball for drum roll effects, lights, and 3 modes of play for hours of fun.